I am trying to enjoy every moment of the central bank driven global asset mania before it implodes because years from now people will look back and be both astonished and fascinated by everything that was occurring before the implosion. We could walk through the stock market, residential real estate, commercial real estate or even something like fine art, but nothing comes close to the insanity taking place in the bond market. I expect many equity and real estate markets to be sledgehammered lower in the years ahead, but the greatest losses will eventually come in the one area where investors believe they are the most safe; bonds. People counting on pension funds, 401k's, life insurance policies, and general government debt spending support will be rocked when the artificial world we live in today evaporates. 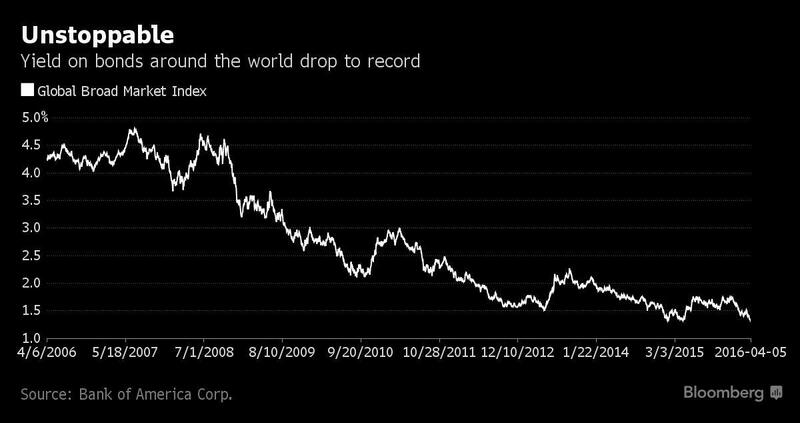 The chart below shows that the average yield on global bonds has fallen to a record low. 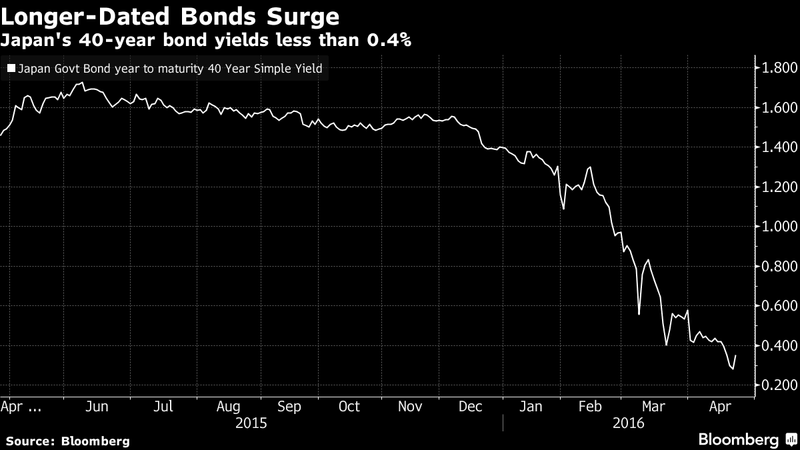 Bond values rise when yields fall. This means investors have, in general, made large paper gains on bonds since late 2008. Things have become so insane there are now $8 trillion in government bonds that have negative yields. Investors now give the government their hard earned money, and they have to write the government a check every month for the "privilege" of letting them hold their money. 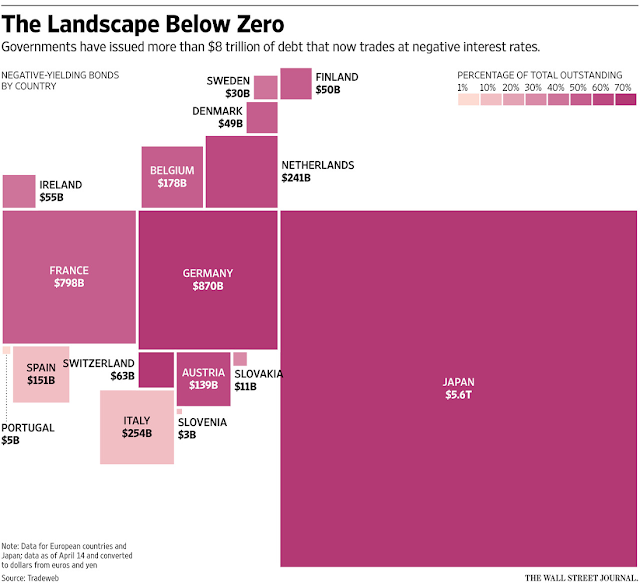 You can see in the chart above the largest portion of negative yielding government debt comes from Japan, so we'll focus our attention today on the madness taking place within their borders. The paradigm of the world we live in shifted from the global central bank put to pre-emptive central banking policy in March of 2009 (for much more on this important topic see: The Grand Finale For Worldwide Asset Bubbles: Pre-Emptive Central Bank Action). No central bank has led this charge with more force than the Bank of Japan. The following chart shows the size of their central bank's balance sheet in relation to the size of their economy (GDP). As they print money to purchase assets the size of their balance sheet grows. 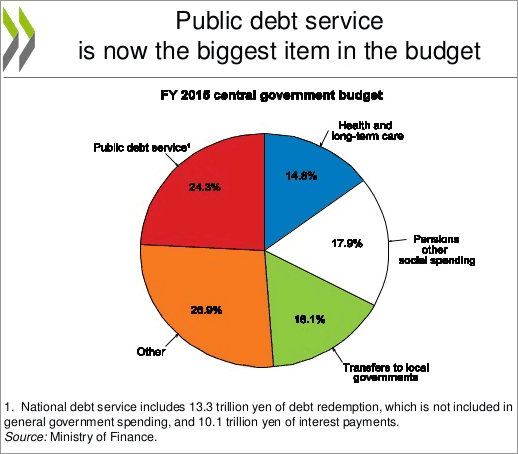 It currently stands at 80% of Japan's GDP and that number is growing rapidly by the month. The graph below shows the expansion of their monthly QE program in the second quarter of 2013. You can see the amount of government bonds they are purchasing every quarter (red bars) is now much larger than the growth in the overall size of the government bond market (green bars). This means they are rapidly gaining a larger and larger ownership stake of the entire market. Japan's government debt to GDP is currently hovering close to 250%, the largest in the world by far (Greece imploded when it hit 130% and the United States is currently close to 100%). They are running a deficit every year equivalent to about 8% of their total GDP. As you can see above, the Bank of Japan is monetizing their entire annual deficit and then purchasing even more of the existing bond supply. 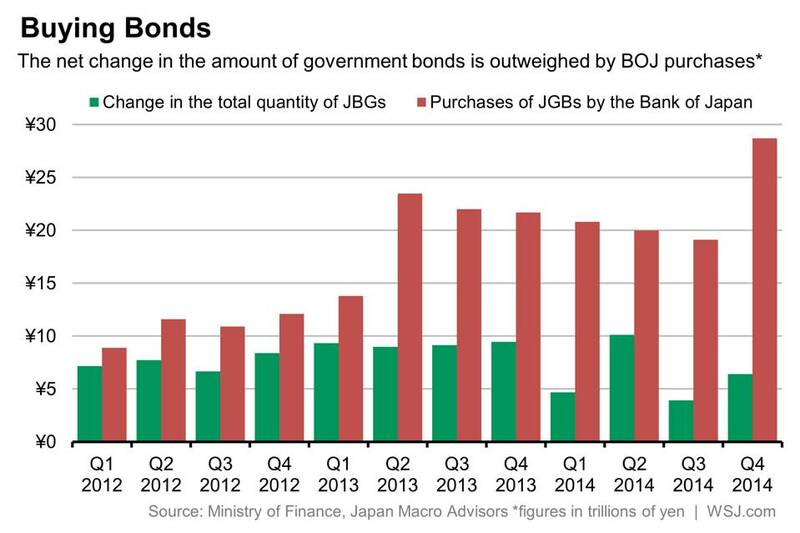 They have essentially become the bond market, and very few bonds are traded outside of the Bank of Japan's purchases. This may already sound insane, but I assure you it gets much worse. In addition to government debt, the Bank of Japan is purchasing corporate bonds and stocks. 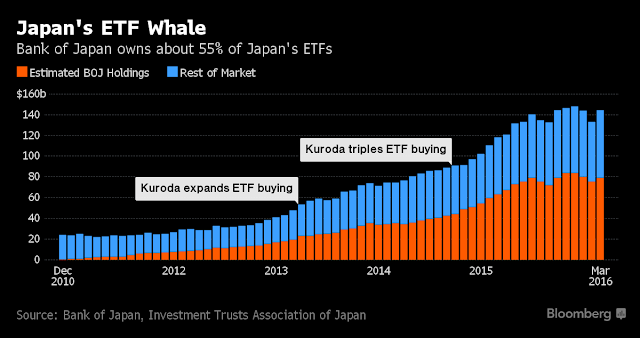 They have been steadily buying such a large quantity of ETFs they are now a top 10 shareholder in about 90% of the companies within the Nikkei 225 index. For those that live in America, this would like the Federal Reserve becoming a top 10 ten shareholder in most of the companies within the S&P 500. The Bank of Japan now owns about 55% of Japan's entire ETF market! The orange bars below represent their holdings. Japan's central bank has moved so far beyond the realm of reality that it is impossible to fathom how catastrophic the ending to this story will be. Here's just one question (of about a thousand we could ask); what happens if and when they would like to "exit" this program? They are going to be dumping shares of stocks on the market and rapidly driving down the price of these shares. 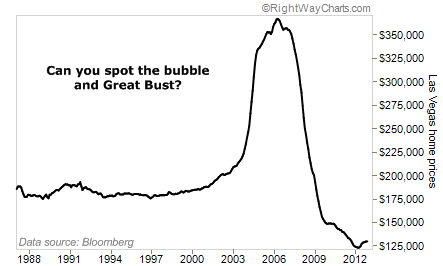 The same question can be asked about the corporate bonds they are purchasing. Companies will see their cost to borrow surge if the central bank should decide to exit their positions. The yield on Japan's government bonds are negative out to 10 years and the 40 year bond fell to 0.29% this week (from about 1.40% to start the year). This means investors are paying the government to hold their money for ten years, and it you want them to hold it for 40 years you receive 0.29% annually. As I mentioned in the opening paragraph, please take the time to drink this all in because this insanity will not last forever. It should be obvious that no one is holding these bonds because of their annual income. They are buying and holding these bonds because they think yields will fall further from here and they will make profits on the underlying principal value of the bond as yields fall. It is a pure speculation play. I should mention that so far this speculation has been paying off huge. Investors holding 40 year bonds (in the chart above) have made significant gains on paper this year. At some point we know yields will bottom and begin rising. The massive paper gains will then start to become paper losses. We know investors tend to not "calmly" walk to the exits when they see others running to the doors around them. Pension funds, banks, and even individual investors will realize they are holding an IOU from a bankrupt government that they have to pay to hold every month because they bought it at a negative interest rate. 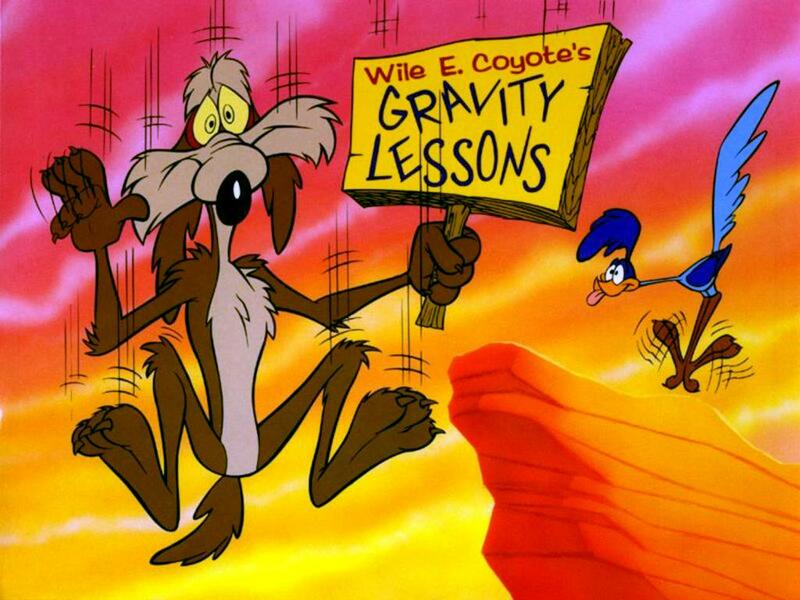 Then the bond market will receive gravity lessons. When interest rates begin to rise the cost to service the government debt (the annual interest payments) will quickly consume all annual tax receipts. 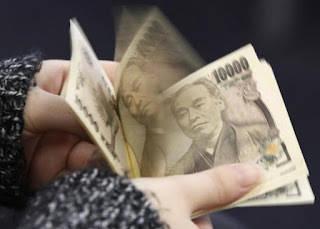 The Bank of Japan will quickly begin printing money just to pay interest on the debt. The value of the yen will likely begin to drop violently while the Bank of Japan tries desperately to defend rates by purchasing even more bonds. While the world watches Japan melting down, many investors will likely begin to connect the dots and realize The European Central Bank (ECB) and the Federal Reserve are essentially playing the same confidence game. What happens from there is, of course, unknown. My guess is the IMF will need to step in and help with the Japanese crisis. This will create a blueprint for how developed markets are bailed out moving forward. 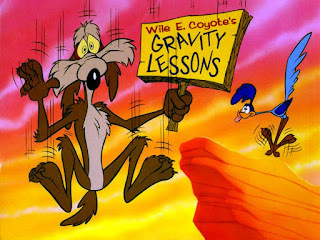 How quickly the United States and parts of Europe follow Japan into chaos will depend on how quickly the public realizes their governments are also bankrupt and the power of their central banks is nothing more than an illusion based on false confidence. What's your advice on how to profit from rising JGB yields? Any ETF or other vehicles that are aware off? There are ETFs you can search for that track the inverse movement of Japanese bonds. As a word of warning, the timing on this will be important and NO ONE knows how much longer the insanity can or will continue. There are a lot of investors who tried to short US housing in the early 2000's, but they could not hold onto their trades because the market took so long to turn down. It is also likely the currency will fall first and bond yields will move second. You may want to research options to short the Japanese yen if you'd like exposure there. As always with these macro trades, the best opportunities will come from the derivatives market where hedge funds play and the average investor does not have access. Excellent and pungent summary. Thanks very much for your continued efforts! Thanks for reading. There will be much more to come on Japan this year.